A forum held in Beijing on Tuesday highlighted the growing relations between China and the Czech Republic as the two countries prepare to celebrate the 70th anniversary of diplomatic ties. 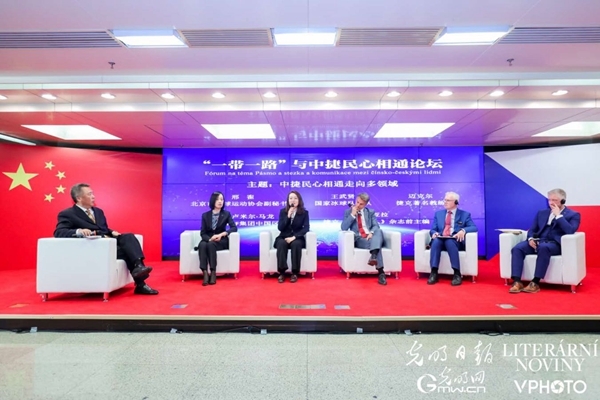 The forum, themed "'Belt and Road' and People-to-People Ties between China and the Czech Republic," was jointly organized by China's Guangming Daily, a state-run media outlet and the Czech Republic's Literární Noviny. The forum drew more than 100 government officials, business leaders and representatives of social organizations from the two countries. It aims to renew bilateral friendship, explore new ways of cooperation and chart the course for the future growth of relations. Czech President Milos Zeman sent a congratulatory message to the forum, saying that with "interconnectivity" as its key word, the Belt and Road Initiative is among the greatest initiatives in today's world. "I believe that countries participating in the Belt and Road will succeed in boosting interconnectivity, as the initiative seeks to connect not only different continents, but also different peoples," he said. Yu Lei, a counsellor of China's Ministry of Foreign Affairs, said at the forum that the bilateral ties between China and the Czech Republic have entered a new stage of rapid growth in recent years, manifested by close high-level exchanges, deeper trade and business cooperation, and increased people-to-people ties. He said that the Czech Republic has been China's second largest trading partner in Central and Eastern Europe for many years. Thanks to four direct flights between the two countries, Chinese people made more than 600,000 trips to the Czech Republic last year, and China is now the Czech Republic's third largest source of tourists, Yu added. As China strives to involve more people in winter sports in the lead up to the 2022 Beijing Olympic and Paralympic Winter Games, the country is working more closely with the Czech Republic in ice hockey training, adding a new dimension to their bilateral cooperation. Wang Wuxian, who is in charge of foreign exchanges at the Chinese Ice Hockey Association, said that a 24-member Chinese youth female ice hockey team underwent a three-month training course in the Czech city of Kladno from November last year to early February this year. Xing He, deputy secretary-general of the Beijing Ice Hockey Association, said that about 10 Czech coaches have been training ice hockey teams in Beijing over the past three years. "Under their guidance, our teams have achieved better performance in both domestic and international events," she said.